While I can fully respect Dr Steinbock as the Research Director of International Business at India, China and American Institute (USA) and Senior Fellow at the Shanghai Institutes for International Studies (China),as a highly respected expert in the field of international business and global strategy, I pause to wonder if Dr. Steinbock is an iPhone user, or is familiar with it. I am not a big fan of Apple, but I happen to use an iPhone and know about this product; I believe that I may be able to present some valid arguments to justify why a dual business model is not necessary for Apple. First,let us conduct a side by Side comparison for Apple and Nokia according to their 2009 annual report. It is not necessary to discuss the gap of the market capital and the stock price between Apple and Nokia. Our comparison will rather review each company’s operational key performance indicators. Apple reports two billion more in revenue than Nokia, but to clarify, the Apple data includes products beyond Smartphones such as iPods and Mac Computers. The iPhone accounts for 30% of the total revenue. Apple’s gross profit margin for 2009 is 41% with an income before tax of 28%. According to the analysis from iSuppli Corp, iPhone has a profit margin of almost 52% for the cheaper model. Comparatively, Nokia, a manufacturer of mobile devices, has 32% of gross profit, with only a 2.3% income before tax. Nokia’s R&D cost is high at 13% vs. only 3.1% for Apple. From this comparison, we may conclude Apple has a business strategy of “Differentiation”. Apple enjoys a high profit margin from the well-designed high-end Smartphone. Apparently, Nokia is heading toward a different strategy to become a “cost leader” to focus on more low end products with lower margin. My speculation is further articulated by the article, Nokia to Halve Smartphone Production in 2010, Official Suicide Watch Starts Now. Nokia announced it would halve production of its Smartphones in 2010, to gear itself toward a concentration on ‘dumbphones’, or “mid to low end Smartphones.” Nokia Smartphones’ R&D also “cut down unnecessary differentiation”. While I choose not to comment on whether Nokia is choosing the right business strategy, it seems a fair assumption that their focus on low-end Smartphones is directed toward a global focus met to face an increasing demand in emerging economies. On the other hand, Apple, having a singular iPhone product in their Smartphone portfolio, was able to increase their market share to 16.1% in 2010 Q1, a 131.6% leap from a year ago. (Source: Apple boosts global smartphone market share big-time, holds on to No. 3 position) With the introduction of iPhone 4, I would expect to see increased market share for Apple. It seems paramount that we should ask this question: Why is the Apple R&D cost is so low in comparison to Nokia? I believe that the answer lies hidden within Dr Steinbock’s article. Nokia is a device manufacturer however Apple uses OEM (Original Equipment Manufacturer) Foxconn to produce their Smartphones. Although I do not have inside information, I believe Apple collaborates with Foxconn for product development. Utilizing the supplier’s technology and production expertise, Apple is able to focus on their core competency of product design and software program development and achieve such low R&D cost. Apple has only one model of iPhone with some variation of memory size, which is naturally easier for mass production, and allows the achievement and maintenance of lean inventory management. This results in a lower COGS (Cost of Goods Sold) and a higher gross profit margin. Nokia, on the other hand, released 13 Smartphone models in 2009, which increased not only their R&D cost, but added a level of complexity to its supply chain and increased the capital investment required to manage the vast array of models. So when iPhone is considered a luxury product in the Smartphone market, why would they require different pricing strategies for different markets? It is my belief that it is not required. Just as Louis Vuitton for purses or Rolex for watches, premium brands do not require different prices for different markets. This is especially true for the Chinese market, where premium brands are considered to be an indicator of personal social status. I cannot speak for the Indian market without further research, but Chinese consumers are willing to pay for premium and trendy products. Before Apple settled an exclusive sales agreement with China Unicom for the exclusive right of iPhone sales, iPhone had been sold throughout China on the black market at a premium price. Many Chinese consumers asked their friends or family in U.S. to buy unsubsidized iPhones for them to use in China. The iPhone initially failed in China, not because of the cost barrier but because of GSM (Global System for Mobile Communications) compliance, thus forcing Apple to redesign the iPhone for China to meet the Chinese wireless network requirements. Even after prices were cut to 3,000 yuan ($439.46) in April by the carrier China Unicom, Chinese consumers are still paying significantly more than U.S. consumers for an iPhone without subsidy from the wireless network carrier. However, contrary to what Dr Steinbock claims in his article that Apple flopped in the Chinese market, Apple’s Chinese iPhone sales exploded and largely contributed to the growth of Apple last quarter sales, with estimated 2.1 million iPhone sold in China within 6 months. Does Apple need a global strategy? Absolutely, yes. Apple should establish and expand the distribution channels in different nations, with possible redesign to meet local market requirements. It is also crucial for Apple to work with its suppliers to meet its increased demand. Does Apple need a dual business model for the advanced economies and emerging economies? I do not believe so. iPhone sales are disappointing in India or other emerging markets due to different consumer behavior, so be it. There is still much room for growth in the global high-end Smartphone market. Smartphone users typically replace their phones every two years as contracts expire. Apple enjoys such high profit margin from a single Smartphone model, so it is not necessary for Apple to add additional resources to develop a low-end model for those markets and dilute its premium brand image, just like we can not imagine Louis Vuittonor or Rolex producing a low end product for low-income consumers. Being a global leader does not necessitate becoming the leader of market share in quantity while struggling with profit margin. Apple is definitely a leader in the Smartphone market with their product design mission to “be sweet to customers and vicious to rivals”. I foresee that we will continue to see the growth of Apple in the Smartphone market. The second episode of Business Buzz Podcast with Jodi Keily discussed how to use Facebook effectively for marketing tools. We discussed the changes of Facebook from a pure personal social networking to a commercialize marketing tool, the challenges for businesses to manage their fan pages, the possible solutions and the future trend of using Facebook for marketing. Betty also joined us as the guest host to talk about her challenges as a small business owner in dealing with facebook fan page. Jodi: Welcome to our “Business Buzz” podcast where today I am joined by Zachary Long and our guest host for today’s episode Betty Feng. And Betty is actually our technical specialist but she is joining us today for this particular discussion because as we were brainstorming ideas on what to talk about, it was actually Betty who brought up the topic of Facebook marketing. And as the discussion evolved, she had a lot of great insight so it just made sense to bring her in today as a guest host. So as I mentioned, we’re going to be talking about Facebook marketing and the challenges that small businesses encounter when they are using Facebook as a marketing tool, and also some of the issues that people should consider when they start using a Facebook marketing page. My name is Jodi Kiely and I’m a freelance PR and communications consultant based out of Orlando, Florida. Zachary: And my name is Zachary Long and I’m a social media user and I also operate the Twitter account for the Orlando World Center Marriott at the front desk. (@TheFrontDesk). Betty: My name is Betty Feng and I’m the co-owner of a camera rental business called Camera Concierge and I’m also the technical specialist of the “Business Buzz” podcast. Jodi: So as I mentioned earlier, today we’re all going to be discussing Facebook as a marketing tool, and I’m just going to make the broad assumption here that everyone listening to the podcast is familiar with Facebook. And you all should be and if you aren’t you better have a great excuse because it is pretty much arguably the number one social networking site in the world. But it’s interesting because the site is also going through a transformation and that is it is turning from a social networking site to a marketing tool. And we’re just going to discuss the shift that this brings up in terms of the challenges that companies encounter as they start experimenting with Facebook marketing. So before we go into that, I’m just curious as to what Betty and Zac have to say about this trend overall. Betty: Well, Facebook started as an alumni networking site requiring members to register with a university email address. Later on the greater public was able to sign up and as it happens, we are now seeing and befriending our parents, friends, bosses and colleagues. HR managers now screen candidates on their Facebook profiles and Facebook is becoming more and more complicated and challenging with its changing privacy settings. This site used to be place for all of us to share our secret moments with friends but it is now changing into a commercialized social network with many concerns about privacy settings, privacy control and information sharing. Today many companies have jumped onto social media tools to market their businesses and connect with their customers. This kind of transformation of Facebook is just amazing. Zachary: Like Betty was saying, there has been a real commercial shift in Facebook and as Jodi first pointed out, it is the number one social networking site, pretty much in the world hitting about 500 million users right now. And businesses are definitely taking notice. Currently for every company or every brand you are now able to find a fan page for and a business fan page on Facebook, about the brand of the company. One of the interesting things is how brands have evolved to interact with their customers directly through Facebook. As Betty was saying, there has been a significant shift in the business world toward Facebook as businesses in general have taken notice of the site. As Facebook hits the 500 million member mark, it is becoming increasingly important for corporations and any small business as well to have a presence on the site. One of the unique things about Facebook is that users are not some anonymous avatar like a random BBS or forum. These are the actual personal accounts of the customers. And having that demographic information and analytical information is extremely powerful for any company, large or small. And one of the shifts as Facebook has slowly evolved is that with fan pages, you used to be a fan of the brand, but now you “like” a brand. And as changes occur through the privacy settings as well, there has also been a shift in these business’ pages as people create pages for businesses on a corporate level and make them more complex, changing the landing pages that you first see, special sign-up and then you can see a wall post in the way that businesses are interacting directly with their unique users. Jodi: You know, I’m actually glad you mentioned how complex Facebook fan pages are turning into, Zac because I think there is a big misconception for a lot of companies jumping into this is that they think, “Oh, this is just a great, easy way to increase my marketing efforts!” But I think that’s a misconception because it can be difficult if you really do it right and its going to take a lot of investment, more so in time, and if you’re lacking in time or knowledge, then it’s going to require some investment in money as well. And in just observing early users – the companies that have started early on marketing on Facebook – there are some businesses that are struggling to effectively use it. And I’ve kind of noticed a few themes or similarities that they all share. One being that few businesses on Facebook really have a strategic plan. And as a result, they are struggling to update their page regularly – and that could be a time management issue – we can talk about that a little later. I also noticed that some companies are not really engaging with their fans and the irony about that is we call consider Facebook to be social media. So you have to ask, “Where is the socializing?” You don’t have page administrators interacting with customers on Facebook. And I also think that some businesses are really struggling to find good content and so in the end, they are just spamming their customers. And I think that is a challenge for businesses that are new Facebook. How do you strike a balance between promoting yourself but also offering something of value to your customers? I don’t know if you have any thoughts on that, Zac? I was going to look at this through a corporate perspective by taking a couple of examples from companies that have their own social media departments and are trying out some pretty innovative things using Facebook as a customer service platform and to attempt to engage with the fans. Looking at these as basically from smallest to largest, take a company like the Home Depot and their Facebook fan page has a 150 “likes” at this time, approximately – 150,000. People are posting on the wall anywhere from questions and they have the team at Home Depot – they respond directly to these, offering points of contact and real people that they can talk to to help them solve these problems. Another good example to contrast that is a company like AT&T who, as we all know, has not been the greatest liked among the technology community with their service at the moment due to their exclusive contract with the iPhone. You see a lot of comments about dropped service, about calls, and they are basically a service company who you run the risk of having that corporate presence and now you have an open forum where everybody can really post their complaints and their compliments as well, but in a case like AT&T at the moment, their service issues bring more complaints than compliments. Another one example I did want to look at as well is a company like Victoria’s Secret – their “Pink Page” has 2.7 million fans and not all are actual fans of the company. You will see the occasional comment about a Victoria’s Secret product but because it’s so big, you will have regular people basically spamming the wall with posts totally unrelated to the brand, and really there is no way to moderate it because it is Facebook – everything is immediately public. And those are just a couple examples of how different corporations are going about addressing issues, like AT&T and Home Depot responding directly to posts and comments on their wall. But at the same time, another component of both of their wall pages or fan pages is another tab with specials and news about current happenings, using it as a true PR and marketing piece. Jodi: Now Betty, as a small business owner you also have experience with this, too. Do you want to talk a little bit about your experience? Betty: Yes, definitely and it’s a really good point to bring up as different sized companies have different challenges managing their Facebook pages. For me, speaking as a small business owner, we also have our own Facebook fan page and I feel the challenge to provide good content and to connect with our customers. We don’t want to spam our customers like you mentioned, however, our posts can be easily lost in the hundred of posts of our friends’ received every day. I know it’s happened to me over time. For example, I once missed the update announcing my friend’s new baby. So how bad is that? So you can easily miss any post. Jodi: And I think this all goes back to when you’re looking to use Facebook as a marketing tool, companies really need to research it, I think, before they jump onto the Facebook bandwagon. I can think of one company whose Facebook fan page literally died the same month that they started it. The problem was pretty obvious, that is, their target audience wasn’t on Facebook and wasn’t really using social media at the time. I’m not going to name the company, but for what it’s worth, it was in the managed care industry so they were basically a Medicare company. And when you at the demographics of their target audience, it’s an older audience who probably isn’t quick to adapt to social media per se. So I think the lesson with that was that basic planning can go a long way. – What do I hope to gain by having a Facebook fan page? – How will I know my goals have been met? – Who is my target audience and are they even using Facebook? – And for content, what am I going to post on my page? How often? Should I be posting daily, weekly, on weekends and if so, are there specific times that attract more traffic than others and I can’t say for sure – I can point to research saying weekdays attract traffic than weekends, but still, it’s worth thinking about as you start writing your plan. And this goes back to what we were talking about before, finding the balance between promoting yourself and offering useful information for your customers. Zachary: And that’s a great point and I think that any information you post has to be really relevant to the customers. And if your Facebook fan page, if you’re a restaurant and you’re posting about the local politics, do your fans really want to see the politics from you, the restaurant owner? No, they probably want to see something related to the industry you’re in. You want to be posting an update about your industry or a special going on. And to your point about frequency of posts, yes there may be optimal times, but should you hold that content just because you have it or is it more a matter of frequency? Different users would access Facebook different times of the day. You might have the college kid accessing it in the middle of the afternoon or you have a family so maybe you access it first thing at work so that 9:30 is the optimal time, so they maybe access it again when they get off work, maybe 5:45 when they get home. So there is the balance of yes there are optimal times, but do you really to withhold news just because you want to hit those optimal times. Then you’re only delivering news at scheduled intervals and maybe missing larger parts of the story. Some other thoughts on the subject of engaging your fans and finding relevant information is when taking a look at, when using an example, CNN, yes they are a news organization but they don’t post every story, but the stories they do post generate hundreds of likes and hundreds of comments – it’s something that really gets discussion going. They know their target audience are obviously watchers of the news and by filtering that news and finding only a couple relevant stories that they think will generate the most interest, they are basically effectively managing their posts, not overwhelming their users, but giving the ones that could spark that discussion and spark more sharing among Facebook users that do access the page. Jodi: And Betty you were showing me some research on the frequency of Facebook updates. Do you want to share what your learned? Betty: Yeah, I learned more about the frequency of posting. I read some conflicting research regarding the best time to post on Facebook. One report says Tuesdays is the best time and weekends are the worst since everyone is going out on the weekends so they don’t log onto Facebook. But another report says the weekend is the best time so with this conflicting information, without seeing any raw data myself, I would just recommend having one or two posts every day. And back to Zac’s point, the content is more important than frequency. When you have good content, your fans will more likely leave comments and “like” it which will bring the post onto the Facebook home page top news feed, even in posts posted a while ago. It’s also very important to interact with your fans besides offering incentives such as coupons, companies can just use other techniques such as contests to give more fans incentives to participate. So the challenge for most of the companies is to post good content. It is not an easy task to create good content without professional knowledge if the business wants to be seen as an expert or provide useful information. Big organizations can hire a dedicated social media coordinator to write content. With small businesses, we often see that they are struggling to create good content without a significant input of time and energy. So for many organizations and businesses, they often post news and photos of their events (as their page contents). I also just want to emphasize the importance of a person responding to comments. Fans will leave a fan page if their questions or comments are not responded to – as least that’s the case with me. I’ll leave some comments on a company’s Facebook page and if I don’t get a response, I will be disappointed and I will “unlike” the page. Jodi: I think you brought up a lot of good points and thing I want to return to is something you said about the issue of time management. I think that is a big challenge for some companies and you have mentioned hiring an external party to manage a social media site. It makes sense: Folks get busy, they forget and their fan page can be ignored. Considering that, what are both of your opinions on outsourcing that to a third party? Zac: I think there is value. You both mentioned that time investment is necessary to successfully execute a page. There is value in freeing up resources – if you’re a small business and your expertise is not social media, it does make sense to find someone who is, but with the caveat that they have to have an overall strategy and know who your fans are and know what content is relevant to them. And to our prior points, it has to be quality content that is targeted to the audience. Betty: Yeah, totally agree with that. I would love to outsource that task if I could afford to do it, so a dedicated social media expert could create good content, manage Facebook promotional events and interact with the fans in a timely manner. I have to be honest in that I often forget to update our own Facebook fan page for Camera Concierge, as I have so many other things going on. So Jodi and Zac, perhaps you guys can create a consulting company to manage social media accounts for small businesses. So what do you think? Jodi: I’d be open to that, I enjoy working with Zac! And as we go back to the issue of time management and outsourcing this job, as an independent consultant, I do feel that it can be done effectively, but you have set some ground rules or you have to have some sort of plan, like Zac said. And one is, share your company’s social media policy with your consultant because this is going to be a great way to not only to provide guidance on what the company’s rules are in terms of using the company social media site, but it also protects you in a way. Social media policies are kind of a new thing, you can find examples online of companies who have made their’s public. I have also written about a little about this on my blog at JodiKiely.com – that’s J-O-D-I-K-I-E-L-Y dot com and if you just search in my archives for social media policies and guidelines, that could be a good starting point for any company that has not drafted one – and I strongly suggest that if you haven’t started a social media account yet, draft your social media guidelines or handbook before you do. If you already are using social media and you don’t have a set of guidelines, really consider doing that right away. There are just a lot of benefits to doing that. But another thing I would like to stress is that if you are going to outsource your social media efforts to a contractor, make sure there is a constant flow of information because your contractor is not going to have all that inside information about the business that you have. So for example, if you have a big trade show coming up, make sure your contractor knows where that trade show is going to be, what the dates are, where your booth is going to be located in the convention center so all that can be shared with your Facebook fan page members and followers. Also, if you have an e-newsletter, make sure your consultant is receiving that because that’s a great source of information in terms of updating your page as are news releases. Just make sure there is a flow of constant communication. Betty: Yeah, I totally agree with you that the consultant needs to be updated about what’s going on with the company in order to provide relevant content to customers. Otherwise you’re providing irrelevant information and confusing your fans. Jodi: You know, in an ideal situation, the person writing your e-newsletters can be the same person managing your social media account. You know, it’s just something to consider. Also, in my experience, I’ve found out that some of the best information comes up at the spur of the moment. Like, for example, the CEO will be on T.V. – you need to make sure your social media coordinator or whoever you are outsourcing this to is aware of these kind of details that come up at the last minute so that they can put that online and give your fans a chance to catch you on T.V. or hear you on the radio. I don’t know if either of you have anything more to add on that? Zachary: There’s just one other point. Besides have a social media policy, have a real strategy and know what you want to achieve with the site. Is it more fans – well, why do you want more fans? Is there a real reason behind that or do you really want to engage your fans? Before you go out and hire a social media consultant, sit down with the leadership team of whatever organization it is and let them develop some goals and the metrics of what you want to achieve and why you want to achieve those – really think it out. Jodi: Right Zac, and I totally agree. Like we said it all comes down to planning and communicating your plans with the right people. So before we tie things up, I have one question for Zac and Betty and that is their feelings on Facebook as a trend in social networking. Facebook has about 50 million registered users (sic) and apparently it’s getting more visits than Google. So considering this, how do you guys feel about Facebook as a marketing strategy long term? Betty: Personally, I find myself spending less time on Facebook for my personal profile just because Facebook is so commercialized today. I don’t feel that personal touch anymore. It’s great to connect with friends and update others on the changes in my life, but I’m afraid people will actually spend less quality personal time on Facebook because of information and advertisement overload. Perhaps some people are logging in just to spend time playing Farmville – I can tell by my friends’ annoying status updates. I don’t know how a company can target to those customers playing Farmville, but I feel Facebook is becoming a large business forum site like Zac mentioned earlier. The good thing about that is that customers can enjoy the convenience of getting updates on fan pages and it’s easy for them to use Facebook to interact with companies or organizations they like. Most importantly, the customer can use Facebook to voice their opinions. With such large amounts of users, Facebook is a mandatory marketing strategy for many – not all- B2C businesses if Voice of Customer is important to them. Zac: And that’s exactly right. Facebook is too large to ignore. At this point in the game, it’s pretty much mandatory that you have some sort of presence on Facebook. And if you’re not, you’re missing out on a huge marketing opportunity and interaction opportunity. It’s an opportunity to connect on a personal level because these are real people behind all the accounts. And they are not afraid to voice their very public opinions on your fan page about what you’re doing right or wrong at the company. And so as a company again, you have that responsibility to respond. And if you’re not responding then that kind of snowballs the whole PR effect and makes matters worse by not responding so there is that catch 22. Now because you’re public and because they’re leaving comments about you, you have an obligation to respond to those comments or be seen as being unfeeling or uncaring. Jodi: Well there actually are a lot of case studies out there on the web addressing that problem. I’ll see what I can do about tracking those down and posting those on the blog in case anyone is interested in reading those. I guess in closing we can all agree that Facebook marketing can be worthwhile but there is a wrong and right way to approach it. They key is be strategic about it, do your research before you jump into the pool and don’t forget to interact. So this wraps up our episode today. On behalf of all of us, I want to thank everyone for joining in and listening to us. If you want more information, you can check out my blog at JodiKiely.com or you can follow me on Twitter @Jodi_Kiely. Zac: And of course you can follow me on Twitter as well and find me just by googling my name, pretty much. Zachary Long, spelled Z-A-C-H-A-R-Y L-O-N-G. Go to @ZacharyLong on Twitter, zacharylong.com or just google me. Betty: It was my pleasure being guest host for this episode, and listeners can find my blog at GSCMotion.wordpress.com and follow me on Twitter @BettyFeng (one word). Also, don’t forget to join our Facebook fan page for Camera Concierge if you are a photography fan. Jodi: Great, thanks for listening everyone, we hope you gained a lot from our discussion today and thanks to Betty and Zac for another great episode! Zac, my husband, was interviewed by Wall Stree Journal reporter Sarah Nassauer about our Social Media efforts at the hotel! The article is featured in WSJ (printed and online) on 6/24. Here is the article “I Hate My Room.” The traveler tweeted. Ka-Boom! An upgrade! and the related Podcast “Ways to Get Better Services”. In May, I took a trip to Shanghai, China, for a project to establish a partnership between a Chinese horticultural company and a Holland breeding company. It was a win-win collaboration for both, not only helping the Holland company to break into the Chinese market with minimal resource, but also upgrading the Chinese company with new product varieties without adding R&D investment. During the meeting, there was only one concern from the Holland company: the price for the new products in Chinese market were set lower than the Holland company expected. The Holland representative could not accept the recommendation from the Chinese company. 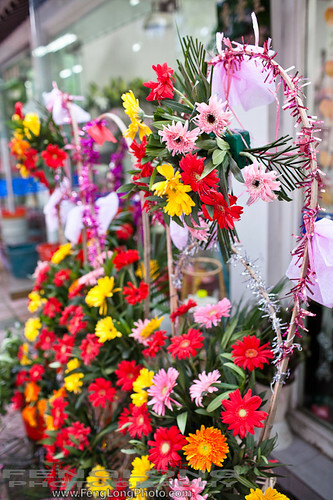 After all, the same types of flowers are sold at a premium in other global markets! In order to understand this pricing recommendation, we visited the horticulture supply chain in that region, from flower growers, to flower market, to flower retailers. After examining the entire supply chain, the representative agreed with the lower pricing strategy today for future long term growth. When the Holland representative saw the greenhouses in the region, he commented: What a low cost production! The farmers enjoy the benefits from local natural geographic condition. All things being equal, such as the amount of fertilizer used for every square meter of land or type of greenhouse equipment invested, it costs the U.S. growers five times more than the Chinese growers in labor, not just because of cheaper labor in China. The underground water system in the Eastern China region provides the Chinese growers a natural watering system. Therefore there are much less labor required to water and grow the plants. On top of it, the government subsidizes the greenhouse facility investment, which lowers the production cost even more. In the different areas of the same region, there are significant differences among greenhouse business models. We visited the greenhouses managed by the young generation of growers, who are connected using the internet and smartphone like an iPhone or Android phones. They are educated and ambitious. They want to grow the best plants and dominate the market. Due to the economy of scale, they can not only achieve lower cost from higher production efficiency but also receive a volume discount for plants and farming materials. From them, I see the picture of tomorrow’s Chinese agricultural industry. The traditional farming model co-exists with the modern farming management. Many individual farmers manage only two or three small greenhouses in their backyard. All farming work is done by the family members. Those individual families unite together to form an organization. The organizer of the group sells their harvest together and also combines their purchasing of raw materials to lower the purchasing cost. The organizer benefits from the commissions of sales. 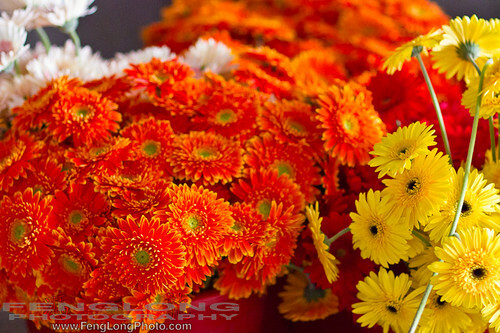 With the advantages from Mother Earth and the effective business model in the local market, the production of flowers is efficient and lean, and thus minimizes the production cost. A visit to the local flower market explains why premium pricing will not work even though the growers grow high quality flowers. The local market consists of the first level wholesalers and the second level distributors. 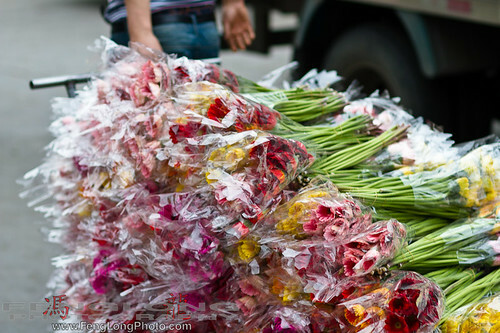 Wholesalers ship the flowers by truck from their fields to the market. Distributors will buy from several wholesalers for different varieties and then deliver them to retailers. 1) Packaging. There is minimum packaging for the flowers. In other global markets, the flowers are carefully packed in paper cartons or in buckets for best protection and petals expansion. 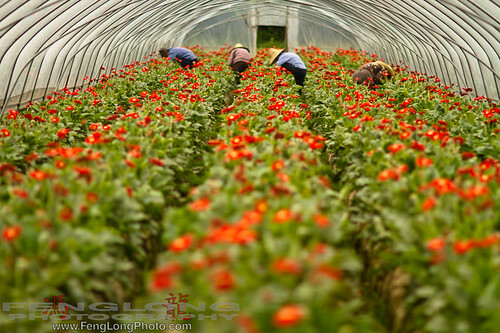 In China, the growers only use a single layer of plastic cone to cover the petals. This kind of packaging method does not provide much protection for flowers during transportation. 2) Shipping. From the growers to the market and from the market to the retailers, the flowers are firmly stacked inside trucks or cardboard boxes without any space to breathe. In the same size of truck, the Chinese farmers can ship almost 20 times more than the U.S. farmers can. I joked that the extreme loadability was such an effective way to minimize their supply chain “carbon footprint”! 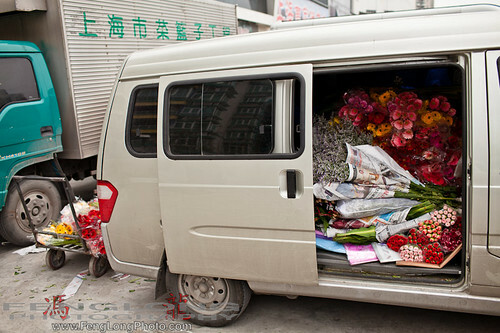 The ruthless transportation minimizes the transportation cost for flowers, damages flowers during transportation, and causes a much lower price for flowers without perfect presentation. 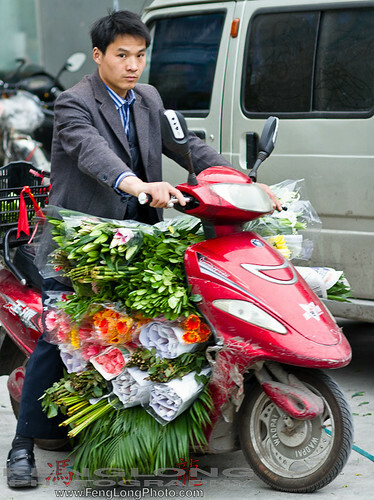 Retailers and the final sales of flowers determine the brutal transportation in some way. The majority of customers of retailers are not individual consumers like you and me, but businesses! 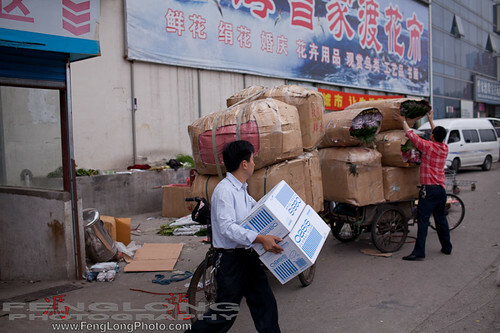 It may be a phenomenon only in China that businesses buy a lot of flower baskets for business openings or events. So, flowers are not sold for a long vase life but a very short exhibit life of a few hours. Under these kinds of circumstances, flower quality is really not a selling point unless those flowers are used for a wedding ceremony. Unfortunately, unlike luxury products, such as a purse, flowers are not a product defining a consumer’s social status. Therefore, consumers pay less attention to flower quality so retailers will not push upstream distributors to improve flower quality by minimizing damage from transportation. For any global company breaking into a new market, it is extremely important to evaluate the local supply chain in its entirety from upstream to downstream. By understanding the local supply chain, the company can define its marketing and pricing strategy without disconnecting from the local market. The Holland company would price itself out of the market without understanding the entire process from growing to transportation. 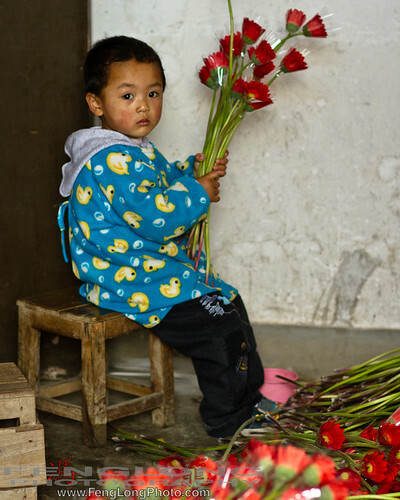 Through a complete investigation into each component of the supply chain for these flowers could we fully grasp the individual dynamics of the Chinese market. Any international company needs to fully assess the specifics, find the local expert who understands the unique market characteristics in order to implement the correct marketing strategy. This article is a case of horticultural product going into a new market. However, the learnings from this case can apply to many other products and industries who are seeking opportunities in the international market. Special Thanks to my husband and photographer Zachary Long who provided photographic coverage in China. Our first Podcast about social media with Jodi Kiely is discussing two important perspectives about Foursquare: the viewpoint of the consumer and that of the business owner. For anyone who has questions about FourSquare, we hope our work will address your doubts about it and you will start seeing Foursquare in a new way. JODI: Welcome to our audio discussion on social media and communications. My name is Jodi Katherine Kiely and I’m a freelance communications and public relations professional based out of Orlando, Florida. ZAC: And I’m Zachary Long. Personally I’m a technology nerd but professionally I’m the Assistant Front Office Manager at the Orlando World Center Marriott where I set up our professional twitter account over two years ago and have recently begun using Foursquare for business for our hotel as well. JODI: Zac and I have teamed up for this audio discussion after many emails, face-to-face meetings and hours of discussion about the use of social media applications in the business world with particular focus on the social media game foursquare. Zac and I know a lot of people out there know what foursquare is, but we also realize there are many who are unfamiliar with it, so before we get into the meat of our conversation, we’ll just give a brief run-down of the game for any newbies out there listening. ZAC: Foursquare, for those of you unfamiliar with it, is a social media game that allows users to “check in” to certain registered venues such as restaurants, stores and offices via their smart phones or online. As users check in to more and more venues, they accumulate virtual badges as a sort of reward. If someone checks into a place more times than any other foursquare user, they are crowned mayor of that venue. In most cases, the title is just for bragging rights, although more and more venues are offering benefits to their mayors – but we’ll get to that later. JODI: Because foursquare is a social media game, it allows users to connect with other foursquare users as you compete for the most badges and mayorships. You can even be notified each time one of your friends checks into a place – a feature that is useful in the case that you are in the same area at the same time and want to meet up. So for example, if I were to visit, oh, let’s say the neighborhood Coldstone Creamery, I would start foursquare on my phone, find Coldstone’s listing which would pop up based on geolcation technology, and press the “check-in” button and then share my location and its address to my fellow foursquare users. ZAC: So if you caught onto that, by simply checking in and announcing her visit to Coldstone to her foursquare friends, Jodi is also doing a little free advertising for the company. Let’s say one of her foursquare friends sees her message, is in the neighborhood and wants to connect. This could potentially translate into not one ice cream sale for Coldstone but two or more, depending on who is in the area when Jodi checks in. JODI: If you’re still confused and have no idea what Zac and I are talking about at this point in the program, I encourage you to check out foursquare online at foursquare.com and to search for articles I have written about foursquare on my blog at JodiKiely.com, that’s J-O-D-I-K-I-E-L-Y (one word) dot com. Zac is also featured in one of my articles with great advice on using foursquare. This audio clip will always be around so feel free to come back to this after you have a better understanding about foursquare if you feel a bit lost. Anyway, today Zac and I wanted to take our discussion about foursquare off paper and into your cars, homes, offices, iPods, speakers and headsets since we both have different views on the application, its uses and effectiveness. While I need no convincing of the marketing power associated with foursquare, as a recreational user, I feel a bit disappointed in my foursquare experience. Zac, on the other hand, has benefited much more from foursquare having used it as a consumer in a greater capacity than I have and as a small business owner, which is what he is going to focus on today. I’m going to let him take over right now in sharing his experiences using foursquare from a business standpoint, but stay tuned because I have some thoughts on the application from the standpoint of a consumer, along with some tips for any business users considering foursquare as a marketing tool. So Zac, take it away! ZAC: When foursquare finally launched here in Orlando back at the end of 2009, I set up a venue for the hotel immediately. At first it seemed like I was the only one who ever checked in there, I would look at the app or on the site and hope I would see someone else! As the months passed we began seeing more check-ins posted to twitter, and this is how we have truly been able to take advantage of foursquare. As part of our Social Media strategy at the hotel, we attempt to connect with guests over these new mediums and a check-in from foursquare that is posted to twitter gives us an immediate notification that someone is here at the hotel. Now that foursquare has launched its new foursquare for business feature we were quick to sign up for that at the hotel as well. With this we have seen success in driving our internal scores through our first Special. We offer anyone that shows us our special screen on their phone 250 free Marriott Rewards points, no strings attached. This forces people to come to the Front Desk to get their reward, and thus gives our Front Desk clerks a reason to talk to the guest and thank them for being a Marriott Rewards member, which is a score we are rated on. JODI: Like I said earlier, I myself need no convincing about the marketing potential foursquare offers users from a business standpoint, and I think Zac’s experience is just testimony as to how this can be an effective tool. But as a consumer, I’ve felt a bit disappointed about my foursquare stint, and I’m hoping my experience can serve as valuable customer intelligence for any businesses out there using foursquare or thinking about using foursquare. Having said that, I would certainly use my foursquare experience from a consumer standpoint when consulting any clients considering jumping into the game. One thing I’d like to mention is that consumers have a bottom line too. Now those bottom lines can vary from having the ability to unlock as many badges as possible to becoming mayor of more venues than any of one’s friends. But for me, the game itself is not of importance. My needs are simple: I want good tips on where to go, what to do, what to order and what to watch out for when checking into certain venues and, I want to save money and gain rewards beyond virtual badges that are of absolutely no value to me. ZAC: So does that mean you don’t really care about your mayorship at Publix super market? JODI: Not unless Publix starts giving me some love back for frequenting their store and publicizing it to my network, no, I could care less! Now I realize foursquare is designed to meet these two needs through user reviews and the ever elusive foursquare deals some venues have been known to offer, but so far, my experience using foursquare has little to show for that. This is probably a very localized issue – for example, foursquare users in New York City may be benefitting daily but here in Orlando, or at least parts of Orlando that I frequent, the city just hasn’t caught on to foursquare fever. This is peculiar to note because I live in and frequent Orlando’s tourism area which is extremely service-oriented and just literally screams consumerism. You would think that out of all places in town, more people would be checking in and leaving tips about their experiences and that more places would be offering foursquare deals – but I just haven’t seen much of either yet. Once ina while I’ll hit a spot that generates a lot of tips, but sometimes there will be none at all, and it surprises me. Maybe I need to get out more, I don’t know! But I guess my point is this: It’s one thing to be on foursquare as a business and reap all the marketing benefits, but it’s another to actually offer something of value to your customers who do use this application on a daily basis. For example, if I’m walking through Pointe Orlando and pass by all these lovely restaurants, I’m not likely to go into any of these if there are no user reviews saying how great these places are. Likewise, if I pass a restaurant I haven’t been to before, unless I’m on a mission to eat and try something new, I’m probably going to just keep on walking – however – if you offer a free drink to any foursquare user (not just mayors by the way) who shows their foursquare check-in at the bar, I may not only come into your establishment to claim my free drink, but I’d probably bring a friend with me and we’d probably order some appetizers and make it a happy hour! ZAC: I definitely agree and part of the problem is there is no widespread adoption of foursquare just yet. It took about 3 years for Twitter to really take off to the point it is now, that I see ads on CNN telling me to follow people. The other issue is that Foursquare uses by nature need to be using a Smart Phone, and tend to be the early adopters and more tech savvy to begin with. Jodi, maybe you just don’t live where all the cool kids are or just that tourists may not be in that demographic. When we traveled to Washington DC and even Atlanta, larger cities than Orlando of course, we did notice a lot more usage of foursquare with users leaving tips and businesses offering specials. Walking down a street and pulling up the application in Midtown Atlanta for example, I had some tips for what taco to try at Tin Lizzy’s and a special from the place next door for free drinks for the mayor of Front Page News. Walking around other populous areas like in DC, people are offering specials not just for mayors which would definitely drive repeat business. Bars or restaurants that offer discounts for 2nd or 3rd visits are a measureable way for businesses to drive repeat traffic while appealing to that demographic of smart phone users. JODI: So would you have stopped by that establishment had they not offered a foursquare deal? ZAC: Well obviously a foursquare deal alone wouldn’t change my mind if the place looked shady, but if I’m in an area and I get a “Trending Now” notification that multiple users are all checking into the same location I might want to at least peek in and see what is going on. The crowd mentality at work again! A foursquare special would influence me to check something out though, again because the whole system is relatively new so anyone using foursquare as a business has to be pretty cutting edge and in the know. JODI: So yes, that would be a good example of a business effectively using foursquare to reach out to new or current customers. I love that! Now, maybe I am doing something wrong on my end, but hear me out because I have a very good reason for my online behavior. 2) I don’t necessarily want the whole world to know where I am at any given time. I just don’t like that. I don’t mind sharing it with those in my foursquare network – that’s one thing – but everyone else in Twitterville? I’m still not comfortable with that idea. So I’m not sure if this is keeping me from really benefitting from foursquare or not, or if it’s just the nature of where I live, but there have been many times when I’ve considered quitting foursquare. The time it takes to check in and stuff, you know, I want to feel I’m getting something out of it, too. It just hasn’t happened yet – at least not here in the heart of Orlando’s tourism center which surprises me. And I do want to add, that I do share, too. I feel I’m doing my part by leaving tips for other users and while some people share tips, I don’t find any as often as I’d like to. I’m not sure yet if foursquare is worth it for me. I can see how it may be, how it could be, but right now, I’m still not sold on its relevance – as a consumer, that is. ZAC: Privacy issues will always be a concern and one of the barriers to entry for something like foursquare to really take off and have a mass effect. As we saw with Facebook a short while ago, privacy is a real concern for users, and Facebook had to go back and switch its privacy controls to make them more user friendly and easier to not share everything with the world. JODI: Anyway, we’ll see. I’ll keep using it for some time and oh – just a warning to anyone who listens to this – don’t take offense but if I don’t know you, I’m not accepting your foursquare friend request. It’s just my own personal decision and again, I’m not sure if it’s a decision affecting my less than impressive experience with foursquare or not, but it’s a decision I’m standing by for now at least. What about you, Zac? Are you accepting friend requests from strangers? ZAC: Nope, no strangers. I treat my foursquare friend list even more strict than my Facebook friend list where I do accept all requests. Knowing where someone I have no vested interest in is checking in has no benefit to me by being my friend. I will still see their tips and to-do’s that they leave around town, and if I’m checking into a venue I will still see them present there. JODI: Ok, so as we tie things up, I think some valuable points were made in this discussion. One being that foursquare, if used properly, can be a tremendous marketing and customer service tool for companies and two, if no one is using it to share, then, well, it’s useless unless you’re only in it for the badges and mayorships. ZAC: That’s why it’s up to users like us, the early adopters, to be the evangelists for foursquare! From a business perspective I have definitely seen the number of unique check-ins steadily rise at the hotel. The momentum is there and with corporations and advertisers starting to get into the game as well, this will only increase. As a business owner I don’t see why you wouldn’t want to at least try it out. One of the great things about Social Media is the low cost of entry, and unlike a Facebook Fan Page or Twitter Account, once your foursquare venue is setup you don’t really have to do much else. Of course launching a special would require the analytics necessary for any ad campaign to see if it is working. JODI: So that wraps up today’s audio discussion on social media, communications – and today’s topic of foursquare. Thanks for joining us! ZAC: Follow me on twitter as @zacharylong and follow the hotel as @thefrontdesk. JODI: And as we close, I just want to give a special thanks to our technical specialist who oversaw the technical recording aspects of putting this audio show together. A huge thanks to Betty Feng who also has a blog at GSC Motion dot wordpress dot com and who is on twitter at BettyFeng (that’s F-E-N-G), BettyFeng (one word). Betty has also shared her thoughts on foursquare with me on my blog and I encourage you to search for the article in my archives and read what she has to say on the topic, too. So thanks again for tuning! We hope you got a lot from our discussion and please feel free to leave a comment on my blog as this is a topic that holds potential for much discussion! It wasn’t for the project which I am currently working on for a China plant tissue culture (TC) company, I would never have experienced the challenge from the weakness of Intellectual Property (IP) protection in the Chinese market. It is the first time that I am working so closely on IP issues in China. The plant Tissue Culture company, Jin Bei (aka, JBSbio), based in Shanghai, China, has been focused in the Chinese domestic market for the past two decades. They have been very successful as a market leader in the region with a reputation of reliable high quality. Last year, with a new investment of $4.5 million into world class new equipment, the company was ready to expand into the overseas market. Through a friend’s connection, they asked me to help them break into the U.S. market. I have been traveling for the company to meet the potential clients, not only to promote the propagation service that the company can provide with its’ Tissue Culture technology, but also to connect with the U.S companies who are interested in getting their products into the Chinese market. With the booming economy in China, needs for gardening and landscape are booming as well, in parallel with the rising market of housing and public construction. So anyone would think that selling into China will be an easy task once we have good products. The answer is no, absolutely not, because of the weak protection of intellectual property in China. Piracy in China is not something new. It’s sad for me to say this as a Chinese, but China has a reputation of counterfeiting design or content of patented products. We are all familiar with those knock-off products such as luxury handbags, watches, electronics, and clothing. The knock-offs are sold at a much lower price, so consumers can choose to pay much less for fake premium products if quality is not a concern to them. There are even some tragedies that people consumed counterfeit food and were poisoned! Many foreign companies come to China and have been fully challenged by the culture of deficient IP awareness. So, China, a country of invention only in ancient times, becomes a well-known country of “stealing” IP. Even though more regulations and laws are created after China entered the WTO, the IP control has not become easier for many investors. I am facing a huge obstacle to introduce new horticultural products into the Chinese market. Breeders normally spend thousands upon thousands of dollars in developing a new plant variety through years of experiments and growing. That is why we can see more and more beautiful, colorful plants around us. In the past 30 years, the IP regulation has been well developed in U.S. so most businesses are playing the game by the rules. However, the Chinese market is like the Wild West, which can be easily out of control for horticulture products. Think about it, any plant grower can take a branch of a plant and duplicate it through cutting technology. Learning from the painful experience of losing IP in the Chinese market, some companies choose to give up on China altogether, or only bring to market the second tier quality products, which in result make my objective of introducing new products to the Chinese market more challenging! When I see those beautiful new flowers and plants which can be easily duplicated, I can’t help to feel regret about the fact that Chinese consumers may not have much chance to enjoy those nice and beautiful flowers in the near future. First, choose a reliable partner with a good reputation. It may not be an easy thing sometimes because Chinese hardly says “No” to opportunities. So, if a company tells you “No” for some reason, it is actually a good sign that this company is doing business honestly. At the same time, spend time to research the background of the potential partner, to visit their facility, and to observe how the owner or manager works and treats their employees. A company that treats their employees well will also respect their business partners, which is potentially a long-term trustworthy business partner. Don’t feel frustrated if you have a bad experience in the Chinese market. There are plenty of honest businesses out there looking for a long term partnership. Second, utilize key technology to prevent easy counterfeiting especially when R&D is a big part of the product development. Intel is a great example for this approach. No one can counterfeit their CPU due to their technology. A company can develop complex products unique characters from which core technology cannot be duplicated. The third approach is to use the trade mark and a branding strategy. Believe it or not, China has a culture of brand awareness and will pay a premium for a brand which is associated with high quality and a high social status. Not to mention those well-know consumer goods, JBSbio, the Chinese Tissue Culture company, uses the branding strategy for their own breeds and has been successful to protect their products in their homeland. The foreign company going into the Chinese market should definitely use a branding strategy at the beginning of entering the new market to establish their name and increase brand awareness. The last strategy will be entering the market with a second tier product or with products which are going to be out of patent if an IP violation is inevitable. Charge premium prices at the beginning of market introduction and then lower the price when the market is flooded with knock offs. Meanwhile, introduce the market quickly with new products to sustain its market leader status..
As a conclusion, it can take another decade for China market to have Intellectual Property regulation well enforced. However this obstacle should not become a barrier for any international business to wait for a safer environment and miss the growth opportunity. Understanding the market risk and taking the appropriate approach to go with the flow and capture the opportunity in a new market can be highly rewarding and profitable. In the past several months, I have been working to start up an online business with my husband as our first entrepreneur venture. We always wanted to start our own business and to be our own boss. Based on our passion of photography, we decided to start an on-line rental business for digital camera equipment. From marketing research, competitive analysis, funding planning, product selection to website design, we finally officially launched our website www.cameraconcierge.com on 2/22. We are now taking baby steps to nurture the business and hope it will grow to meet our long term goal. Now we are the business owners, but nothing came together easily. I went through many anxious and stressful moments, especially when the website design was delayed for more than one and half month. However, the new entrepreneur experience already taught me a lot. I wish to share my experience with anyone who desires to start their own business. Many stories of successful entrepreneurship suggest that we should pursue what we are passionate about. That is very true. In the past, I have been tried a few ideas to start my own business, but I stopped pursuing them fair quickly because I did not feel passionate about them. Basically, I feel lazy to put more time in them. However, after I got into art of photography, I feel it is something I will enjoy doing every day. When we are able to turn our passion into business, we will have a better chance to success from our persistence. And we will enjoy doing it as the same time. I remember a survey saying that about 50% of workforce in the U.S. does not like what they are doing. That is a very sad thing for the society. Those 50% will hardly be innovated, motivated or inspired. Many times, we are facing the pressure of paying the bills and could not think about our passion for life. But once we have a moment to map out what we value most for our life, we can sometimes find a totally different path for our career and be happy at the same time. Chase after your passion, pursue your happiness, and be persistent will be the elements of success. I am not saying not to do business plan. It is very necessary to do market research, to understand your competitors, to know your customers and the market size, and create your own differentiated strategy. There are several a few on-line rental camera and lens rental in the market already, but they all were pretty much the same: rent X lens for X dollars, nothing more. We hope to improve that by becoming the resource not just for equipment, but also for sharing and gathering of photographers. Hence, we started this site with the vision to evolve into a gathering point for people like ourselves, amateur photographers looking to improve our skills. Incorporating social media and an open community-based approach, we are providing concierge service when the customers need us. The formal business plan is used for VC or bank loan. So, I say, forget about the business plan in order to start because it is extreme challenging and time consuming to get VC or loan for a startup. Bill Gates did not get loan when he started Microsoft, instead, he maxed out his credit cards to begin with. When we are sparked by our inspiration and intuition, we do not want to wait for angels landing on our shoulders. During waiting, the opportunity will go away and more competitors will be in the market. Once we are confident with our idea and plan, we should start the business as soon as we can by emptying saving accounts, maxing out credit cards, and borrowing from family and friends. The formal business plan will be the next step when we establish the business and ready to grow, then we will be able to show a successful case to convince loaners. There are way too many articles about social media from many experts, so I don’t need to say more about it. Thanks to social media, it gives small business such a great opportunity to market themselves free! However, because it is free, we need to provide superb content to bring the customers back, again and again. Because it is free, we need to spend a lot of more time to engage the customers, draw their attentions and to build relationship with them. We use Twitter, Facebook, on-line forum and newsletter to meet different prospects or tastes of the customers. Social media is all about engagement. As a new player in the market, we need to get our name out, and at the same time to “pull” the customers, instead of “push”. Frankly, I am still learning how to better utilize social media to engage more customers for their loyalty. Beside social media, other grass-root marketing approaches, such as meetup and local clubs, can be great choices for many local small businesses. Those get-together events are great opportunities for the business to mingle with the targeted customers and know them personally. Through word of mouth, the name of business will be known by more and more people. There are so many articles and blogs about marketing through social media. I just read one titled Social media: Listen Less and Sell More, by Clay McDaniel. It’s a great article about how companies should use buzz-monitoring tools to find out what people are saying about their brands and what people want, and then give customers the right promotion through social media. Although Clay meant that companies need to analyze social media data to get social medial promotion right, the title “Listen Less” might be misleading. As a matter of fact, companies need to continue to listen more and then sell more! I wish my personal experience can be a showcase of why companies need to listen more to Voice of the Customer (VOC) through social media and keep customer loyalty. My husband and I used to be loyal Amazon.com customers. We bought everything from books to high-end camera equipment for our small business because their price is almost always lowest one in the market. We paid for an Amazon Prime membership so we could enjoy two-day free shipping. We also shop from their vendors through Amazon marketplace so we don’t need to register at other sites. We might not be their biggest customers, but we spend a fairly large amount on their site. We also rarely returned any shoppings, one or two out of our hundreds shoppings, as I can remember. We’re the best customers every company desires. However, our feeling got hurt recently by their ignorance of our voice through twitter. Recently there have been quite a few incidences of stock-out and long delivery lead-time up to two months with Amazon.com. So, my husband and I both tweet @amazon and asking about the stock-out situation. I understand stock-out happens as a supply chain professional, but I need a response to let me know when I can expect to receive my product, not up to two months! No response. Quiet. So, I tweeted: ”@amazon has fulfillment issue lately even we paid for Prime membership! Too busy with their acquisitions apparently.” Still NO response! Now, I’m angry. Amazon apparently is not listening to customers now because they are too big and too busy, so they don’t need to care about customers experience although they say so all the time. Thus, we found the same products at B&H Photo and Video at competitive price. We would rather pay for shipping to get the products quickly. My husband sent a tweet: “Just placed 1st order from @bhphoto (since @amazon was out of stock).” We didn’t expect @bhphoto to response, but Henry Posner @bandhphoto saw our tweet and bumped our shipping to UPS 2-day rush! This unexpected surprise definitely made us decide to more business with B&H in the future. Now, it’s fairly clear how company should use social medial to sell more. They need to constantly listen to what their customers say about their brands and then interact with their customer. Many times, customers just need some little comfort from their response. It’s OK to be out of stock or delay delivery, but they should do something, such as a small coupon for next purchase, to rectify the situation and keep our loyalty. Service companies already realize the importance of social media and utilize these tools to interact and communicate with their customers in order to provide better customer satisfaction. For example: Marriott hotels were one of the first to use twitter to engage directly with customers through their @MarriottIntl account. My husband, as a Front Office Manager, even monitors the comments about his hotel at property level through @TheFrontDesk on twitter. Many times, I hear stories how customers are happy with their quick responses and small little ways to remedy the damages. Just like us, many customers prefer to express their opinions through the internet even when they’re at the locations, hotels or restaurants. Through monitoring the social media closely and responding to customers complaints will significantly improve customers experience and improve their reputation through “word of mouth”. Yes, I’m now leaving Amazon.com because our Amazon Prime membership didn’t give us customer satisfaction, especially because they ignore our voice through social media and deeply disappointed our trust of their service. Companies listening to Voice of the Customer and giving more than the customer expected will definitely sell more and win over the market. What Garlic Bubble in China tell us about Supply Chain Risk? Due to the collapse of the global economy, there is less demand for garlic, so garlic farmers in China produced 50% less garlic. Due to the wide spread concern of swine flu, Chinese started to buy loads of garlic to keep them from getting sick. The Chinese government stimulus plan pumped its banks full of money and made lending very easy. Therefore, limited supply ran into unforeseen high demand. “Smart” people saw this as a great opportunity thus “the garlic frenzy was turning into some kind of gold rush”. Many people borrowed easy money from banks, and started stocking tons of garlic in the warehouse and waiting for garlic prices to rise. The bubble hence created. Government stimulus plan caused an unintended result. I haven’t read follow-up story how this garlic bubble broke in the end. I can only imagine how a purchasing agent from food industry jumped out of his/her office chair seeing the garlic price increased dramatically in short time. It’s also funny to think that every restaurant or food company has to reduce the portion of garlic ingredient and probably pray for the “garlic bubble” to burst. Another story made me think about the impact of “uncertainty” to supply chain and related supply chain risk management. I was discussing supply chain in the horticulture industry with an industry expert. I was told that the demand for next year is almost out of question to forecast and that whole supply chain seasonality almost doesn’t exist. The big box retailers, such as Wal-Mart and Home Depot, keep pushing out their order forecast to growers since they couldn’t decide what to buy for next year from their weak 2009 point of sales (POS) data. This uncertainty put growers at a huge risk as they face the challenge of missing growing season. If I were a grower, I might be forced to hold up my purchasing decision to the very last minute, facing the risks of higher purchasing costs for rush orders or even not able to obtain the materials I need. If I went ahead to make my own “speculated” forecast, I would face an even bigger risk of ordering the wrong products and put the business in total loss. In the blog of Supply Chain Risk Literature: a complete review, Jan Husdal summarized the typology of supply chain risks. Among them, “uncertainty” is the biggest cause of all risks. Every company is fully exposed to today’s global economy, consequently it’s even more difficult to predict or forecast with high level of “certainty”. Unfortunately, I don’t have a good solution to avoid such risks brought by “uncertainty”. All I can suggest is to realize those risks associated with supply chain, and increase communication with all trade partners. Communicate! Communicate! Communicate! Only doing so will break the organizational silo, minimize the exposure to supply chain risks, enable organizations to act quickly to unexpected incidences, and hence minimize the financial loss caused by supply chain uncertainty. So, what can a garlic buyer in the food industry do to minimize the loss from this garlic bubble? Fly to China and buy a warehouse of garlic immediately! No, I’m kidding, although it can be one possible option. First thing the buyer needs to do is to prevent the situation of out of garlic. Not only he/she need constantly communicate with the suppliers about pricing fluctuation, inform factories or restaurant to check current on hand and incoming inventory for allocation, but also need start searching for other supply sources. They might not able to get a lower price in short term, but, hey, our consumers can still have garlic in our tasty food, perhaps several cents more expensive than they used to be, but we don’t feel it. Recently, I’m working on a project to help a Chinese tissue culture company to break into U.S. market. Something totally different from my past supply chain experience, but it’s quite an exciting experience for me to visit trade shows across the country to learn a new market and its customers. I’m first of all surprised to see that nursery industry is a little bit “low-tech” comparing to all those industries I have been worked with. I would think that U.S. has far more advanced in bio tech than China, but I was constantly told in the trade show that “tissue culture is too high tech to us.” Then I realized that many of the target customers, the growers, don’t provide emails in their business cards. I know emailing is my bad habit, but it surprised me that many are quite resistant to new way of communication when I live in the era of smartphone, Twitter and Facebook. Perhaps nursery industry is quite different from others so I need to adjust, or I should not consider those, who resist e-communication or social media, as the target customer because the tissue culture will be too high tech for them. Oh well.I might be too new for this industry to make comment, but I feel the frustration of when hi-tech meets low-tech. One more thing blows out my mind is when Sales of some companies told me that: I’m Sales, not procurement (so, don’t talk to me). OK, then it’s not right, not only because of their impolite attitude. So, Sales don’t communicate to Procurement regarding using new product or adapting new technology? So, Sales never discusses with Procurement regarding what they’re looking for to be competitive in the market? So, Procurement will make their purchasing decision and Sales will try to sell whatever the Procurement develop? It seems that lacking of communication among “supply” and “demand” can be a huge potential issue for those companies, which indicates that they won’t be an ideal business partner as well. Technology and communication are two essential components for a business to stay competitive; otherwise, newbies will soon catch up and get the lagged one out of the market.